Higgy is February’s Player of the Month! Gordon Young has set his players a ‘Semi Final’ challenge when they take on Hearts in the penultimate game of the U19s season. The Steelmen have just two matches left to complete their 2011/2012 programme, with title challengers Hearts the opponents tomorrow. Young disputes any notion that Motherwell have nothing to play for and insists his side will be fully motivated when they take on the league-leaders tomorrow. “We’ve had our team meeting and my message to the lads is ‘keep it going’,” he said. “If you take out a 40-minute blip against Celtic, I’ve not got a whole lot to complain about over the last five or six months. “We’ve still got everything to play for; every time they pull on a Motherwell jersey they’ve got to impress people because it is their future at stake. After the Celtic game, I adopted a different principle and that was we had three matches left – a quarter-final against Dundee United, a semi-final against Hearts and a final against Rangers. The match will take place at Hearts’ Training Ground (Riccarton) with a 12noon kick-off. 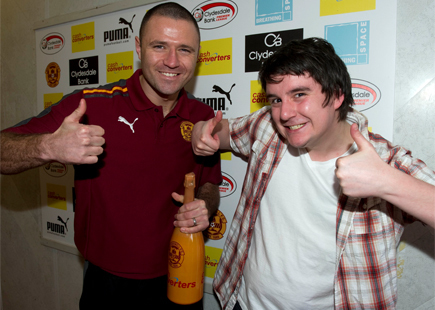 The Cash Converters Player of the Month for February is our top scorer Michael Higdon. Michael has been in fantastic form having scored a fabulous hat trick in the 4-3 win over Hibernian in the SPL. He has also been instrumental in Motherwell rising up to 2nd in the league on equal points with Rangers. ‘Well fan, Paul McWatt, won the privilege of presenting the trophy by voting for Michael at Cash Converter’s SPL page. For your chance to present the March award, all you need to do is vote for which Motherwell player you think has been our stand-out performer over the last four weeks, and, if you are correct, you could be chosen from all entries received to congratulate our star man in person. To cast your vote, go to Cash Converters SPL page or CLICK HERE. Referee for this Saturday’s Clydesdale Bank Premier League clash with Kilmarnock will be the experienced Crawford Allan. The second was the 3-2 win in Inverness a month later, goals coming from Shaun Hutchinson, Keith Lasley and Tom Hateley handing McCall’s men all three points. Next was the disappointing 2-0 defeat at Tynecastle against an on-form Hearts on Christmas Eve and the most recent was the 1-0 defeat at Celtic Park at the tail end of February. A month later he officiated the 1-1 draw with Aberdeen when Gary McDonald, who would later be ordered off, cancelled out a Lukas Jutkiewicz opener. His record in charge of the ‘Well is a fairly decent one, with the Fir Parkers winning six, drawing four and losing three (the aforementioned defeats by St Johnstone, Hearts and Celtic this season) of the twelve games in total. In those games, 35 players have seen yellow, 19 in Claret and Amber, whilst three have been sent for an early bath. Allan will be ably assisted by David Watt and John Gilmour with Brian Winter on fourth official duties. Were you in one of our Hospitality suites on Saturday at the Aberdeen? Or maybe you were in the Cooper after the match? If so, check out our pictures on motherwellpics.com. Our match sponsors Clearwater enjoyed their afternoon in the Joe Wark Lounge and the Centenary and Millennium Suites were extremely busy. Our South Stand boxes were also buzzing with activity, the brilliant result on the park helped. Stevie Hammell and Jonathan Page were on hand to collect their Man of the Match and Young Man of the Match awards respectively. Shaun Hutchinson was the man in the Cooper Suite and motherwellpics was there to capture the action. Goals from Fir Park as Stevie Hammell’s thirty-yard thunderbolt was enough to give Motherwell all three points in the chase for a European place. ‘Well boss Stuart McCall spoke of just how big today’s win over Aberdeen was in the fight for a European spot. A single Stevie Hammell strike midway through the first-half separated the sides and drew Motherwell level on points with second-place Rangers. It was a remarkable result given Motherwell had their fifth and sixth choice centre backs lining up at the heart of the Steelmen back four; Jonathan Page and debutant Adam Cummins both turning in superb performances. “It was a massive three points,” McCall beamed. “I was just saying to the boys after the game that I don’t think I’ve been as exhausted as that during a game. It was crucial that we got the three points today. “Would we have taken a point before the match? Maybe, if I’m honest, particularly if you look at the inexperience that we had in the team without four recognised central defenders. “I thought in the first half we were the far better side and it was a great goal by Stevie Hammell but they got the impetus in the second half when Steve Jennings went off, and it ended up him being off for about ten minutes with his head knock, which gave them a foothold in the game. Stevie Hammell spoke of his delighted at scoring the winning goal in today’s narrow win over Aberdeen. The 30-year old full-back, playing his 419th game in Claret and Amber, smashed home an unstoppable 30-yard strike after just 23 minutes. It was enough to win the match but Hammell’s influence was felt throughout the match. The former Scotland International was also responsible for guiding his two young defensive partners, Jonathan Page and debutant Adam Cummins, through the match with both turning in excellent performances. “I’m delighted with the strike,” he told MFC.tv. “It just opened up for me and as soon as I hit it, I knew it was in. It was a great feeling to score but also to get the three points as it was a big win for us. It was one of those ones that you don’t even feel when you’ve struck it and you know you’ve caught it sweet. “I have to say young Page and Cummins were awesome with Carswell in front of him as well. Usually you find one of them comes in at a time but having to come in today; I thought the two of them were awesome. “It was a big ask for them as Aberdeen are a big physical team and you know what you’re going to get from them. It’s was an absolute honour to captain the side but because you have the armband, you feel an extra bit of responsibility and you’ve got to talk to the boys. Pictures from the 1-0 win over Aberdeen in the Clydesdale Bank Premier League at Fir Park. A sensational strike from stand-in skipper Stevie Hammell moved Motherwell level on points with Rangers and swept Aberdeen aside 1-0 in the Fir Park sunshine. The ‘Well’s makeshift defence of Jonathan Page and debutant Adam Cummins impressed, as did Stuart Carswell as Stuart McCall looked to his youth to fill the gaps created by suspensions to key players. The win was hard fought and despite a lot of second half pressure form the Dons, Craig Brown’s side fell to their first defeat of the calendar year. Aberdeen had the best of the opening exchanges, with Gavin Rae firing well over when he should have at least tested Darren Randolph when space opened up in front of him after just two minutes. Scott Vernon, usually so prolific in front of goal, trundled a shot from distance right in to Randolph’s hands after 14 minutes, as the Dons looked to capitalise on the inexperienced defensive pairing for Motherwell. The Steelmen’s first meaningful venture upfield came after some neat work on the left by Nicky Law allowed Steven Hammell to swing in a deep cross that found the head of Michael Higdon; the Scouse striker was deemed to have climbed on Considine before the ball crossed the line. Considine was then booked for taking out Henrik Ojamaa who was arguably clean through on goal. The Aberdeen skipper walked a tightrope for the rest of the game, committing similar fouls on Ojamaa and Higdon without further punishment. Motherwell took the lead just after the midway point of the first period and it was a goal of some quality from Stevie Hammell. Tom Hateley’s throw fell at Ojamaa’s feet and his intelligent pass inside found the full-back 35-yards from goal. He looked up and unleashed a thunderbolt of a strike past Jason Brown and into the keeper’s top right hand corner. That magnificent strike brought with it some swagger from the home side, with Chris Humphrey having a whipped cross cleared by McCardle, before Brown made a great one handed save from close range after Stuart Carswell had bundled through the Dons’ defence. Steve Jennings almost joined the rare goals club when he rose to head a great Humphrey cross, but his effort was held by Brown. The home side looked as if they would go in with a half-time lead but Andy Considine had Motherwell hearts in mouths just before the break when he was picked out in the box from a Clark Robertson corner; the defender shinned his effort well over. Into the second half and young Carswell almost made it 2-0 after Ojamaa and Nicky Law linked up well on the left to play him in, but Brown made a fine low save to thwart the midfielder. The Dons had early second half chances of their own, Fallon ballooned an effort into the travelling fans when he should have struck on target. Kari Arnason followed that up with a daisy cutter that Randolph could have dropped his cap on. Aberdeen’s best chance of the match came with Vernon got on the end of Ryan Jack’s driven cross but was thwarted by the brilliance of Darren Randolph as he palmed the volley over from point blank range. From the corner, Fallon headed wide, as Aberdeen pressed for an equaliser. Steve Jennings took a nasty headknock in a challenge with Considine and Arnason, meaning he had to leave the pitch for treatment. In his absence, the 10 men in Claret and Amber stuck steadfastly to their game plan and soaked up all the pressure the Dons applied. Upon his return, bandaged and bloodied, the ‘Well faithful gave him a rapturous applause. He continued where he left off by brilliantly tracking back and covering runs, helping out Cummins and Page when needed. Humphrey was terrorising Chris Clark on the left wing and brought a fantastic save out of Brown, when he cut in past the makeshift left back, only to see his shot beaten out by the in-form keeper. The game became s crappy with Arnason and Hateley both booked for rash challenges in the middle of the park. Henrik Ojamaa showed what a handful he could for Reynolds and Considine, and when the Dons’ captain slipped, the Estonian gleefully ran at goal. However, he ran in to a cul-de-sac when a square pass to Higdon would surely have put the game to bed, and the chance was gone. As the game ticked down, Humphrey blasted well wide after getting himself in a similar position to what he had earlier, before crossing to close to Brown with Law waiting in the middle. There was an anxious three minutes of stoppage time but the Fir Parkers held firm for a crucial three points. FULL TIME! 1-0 to the mighty ‘Well. HUGE 3 points! 90mins: 3 minutes added on….Nervous? 85mins: Unlucky Chris Humphrey. The winger’s pace relieves the pressure and he does well to get into the box. His shot blazes well wide. 81mins: McHugh on for Ojamaa. 78mins: Backs to the wall stuff now as Aberdeen turn up the pressure. 70mins: Humphrey’s shot is parried by Brown straight to Higdon. as the big man pulls the trigger, Considine slides in to block. 68mins: And Jennings takes to the field to huge applause….head bandage and all. 67mins: Danger averted by the strong Motherwell wall. 66mins: Page booked for a soft looking tackle on the edge of the area. danger here…. 62mins: Jennings receiving treatment for a cut to the head. 58mins: Considine on thin ice now with another poor challenge. From the free-kick, Page heads just over. 50mins: 4630 fans here today. Thank you to you all. 48mins: Stuart Carswell goes close with a 20 yard drive. Safe hands from Brown deny the youngster. 46mins: And we’re back in action at Fir Park. HALF-TIME: A deserved first half lead for Motherwell. 42mins: Great chance for Jennings as the ball is dinked towards the Scouser’s head, didn’t quite get enough on it to trouble Brown though! 36mins: ¾ of the first-half gone, still 1-0. Motherwell well on top with Ojamaa and Humphrey looking dangerous. 22mins: GOAL!!! Stevie Hammell 30 yard rocket!!!!!! 16mins: Considine booked for a crunching challenge on Ojamaa. 15mins: Chance Motherwell! Hammell floats a ball in from the left towards Higdon, but the big man is ruled to have been climbing. 10mins: Quiet start at Fir Park. The makeshift backline is coping admirably so far. Mon the ‘Well! KICK-OFF – C’mon the ‘Well! “It is a massive result for us, especially with the way that the other games went today. “To be honest, before the game with the depletion we had I would have settled for a point but all of the guys were excellent. “We had four of our centre-backs out today, you wouldn’t worry about that if they had a more experienced player to play alongside but it was a big ask to have them playing together. “Motherwell have some fantastic young players and (youth team manager) Gordon Young and (chief scout) Bobby Jenks deserve a medal for the fantastic work they do. “This wasn’t a vintage Aberdeen performance, we didn’t show the right enthusiasm and confidence. ‘Well host Aberdeen in a crucial Clydesdale Bank Premier League clash this Saturday and if you are coming to the match, don’t forget to pick up a matchday programme. What’s inside? Well, manager Stuart McCall talks in-depth about his views of last week’s match, his opinion on being sent to the stand and his hopes for the remainder of the season. The cover interview is with midfielder maestro Nicky Law. The former Rotherham man talks to the Motherwell Matchday Magazine about the possibility of playing in Europe for the first time, gaining revenge for last week’s Scottish Cup defeat and the importance of the ‘Well support as we head towards the business end of the season. Skipper Stephen Craigan makes a welcome return and rallies the troops ahead of the big match and talks about joining the ‘Well Society. There is a special 10-page section dedicated to our visitors, Aberdeen. Not only is there a rundown of the current squad and a review of the season so far, we get the views of Don David Falconer, Peter Elder looks back at one of the more memorable matches between the sides and former Steelmen star Stephen Hughes takes part in our Q&A. And that’s not all. As well as match report from last week’s match with the Dons, regular features such as On This Day with Graham Barnstaple and Gavin McCafferty in From the Press Box return. Our Fanatics series also returns, David Fraser or Frazzle to the online Motherwell community, answers the questions and there’s a review of the U19s 5-2 defeat at the hands of Celtic on Tuesday afternoon. But wait, there’s more! We take a look back at 1990/91 in our Golden Years feature and there’s an in-depth statistical look at referee Iain Brines. We have the latest from The Ticket Office and the Commercial Department and the latest stats, facts and figures for the 2011/2012 campaign.